And all because someone whispered: ‘When you seek to outperform the competition, there is only that much one can do, but when you select to outperform yourself, the sky is the limit. The Company is a globally competitive bead wire manufacturer growing faster than the industry average. The Company is virtually free of long-term debt. The Company intends to reinforce its position as one of the largest bead wire manufacturers in India (post-expansion) and the only bead wire manufacturer in Thailand. Consolidated revenues rose by 14% while consolidated post-tax profit decreased by 9.21%. Revenues from Indian operations grew by 13% while standalone pre-tax profit increased by 10.14%. Revenues from Thai operations escalated by 25% while standalone pre-tax profit fell by 31%. Raw material costs increased 28% from year-start to year-end. The Company could have waited patiently for costs to decline. It selected to virtually reinvent itself instead. By fine-tuning manufacturing practices, re-examining raw material procurement efficiencies and overhauling financial practices. The result: working capital cycle declined, cost of funds moderated, capacity utilisation increased and product quality improved. India — 36,000TPA Installed capacity at the beginning of FY2018-19. Plan to take it to 72,000TPA installed capacity in FY2018-19. Any Long Term contracts with the clients? Rajratan Global Wire is engaged in a business where customers emphasise the need for on-time delivery of quality products. In view of the mission-critical nature of bead wire in ensuring road safety, customer-vendor relationships are generally longterm in nature. This extended relationship tenure is reflected in the Company’s revenue profile: 15% of the revenues earned during FY2017-18 were derived from customers working with the Company for at least two years and the rest from customers working with the Company for five years or more. The ownership of automobiles in India is a fraction of the global average and we expect this skew to get corrected rapidly. Increased incomes and aspirations will result in growing personal vehicle ownership and investment in transportation vehicles by commercial fleet owners. Most of our tyre customers are expanding their installed capacities, escalating the prospective demand for bead wire. Even as automobiles go through an extensive structural transformation – from fossil fuel-driven to electric variants – we do not foresee any threats when it comes to tyre substitution, assuring steady growth over the long-term. The Company’s manufacturing operations are located in two countries (India and Thailand). While India is the fastest-growing major economy that has seen a substantial uptick in automobile offtake, Thailand is Asia’s largest tyre manufacturing hub where our subsidiary is the only bead wire manufacturing company and enjoys a 20% market share. The bead wire outlook for the Asian market continues to be favourable. China is rationalising its capacities in a bid to shrink its carbon footprint. 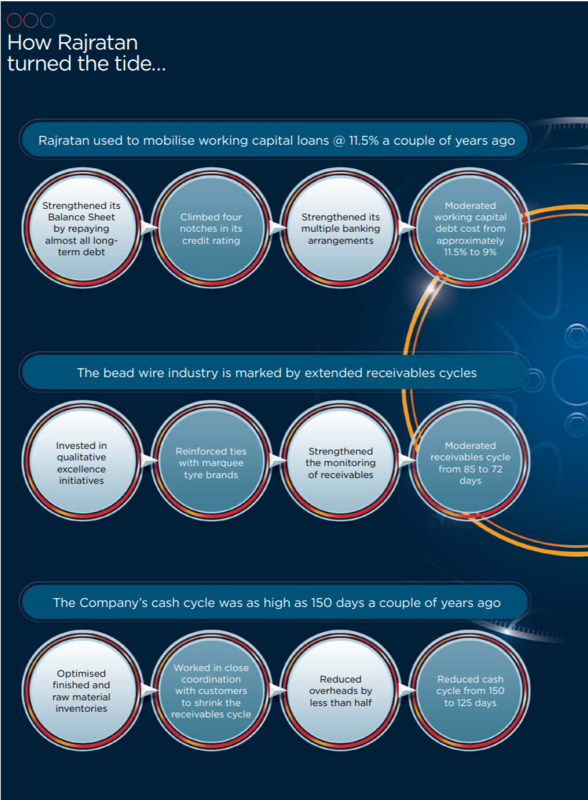 Q: What were some of these challenges faced by Rajratan Global Wire? A: The Company encountered unprecedented volatility on the raw material front: the cost of its principal raw material increased virtually every month during the year (once on two occasions within the same month). The cost of wire rods escalated from Rs. 35,300 per tonne to Rs. 45,500 per tonne by the yearend. In a business where the cost of raw material accounts for 65% of the total cost of production and where costs can be passed on to downstream customers only once every quarter, this record increase in costs stretched the Company’s finances, propelling the management to realign its cost structure and revisit its working capital management. Q: How did the Company overcome this challenge? A: There were two realities that helped the Company counter this substantial increase in raw material costs – one on the external front and one on the internal. Froman external perspective, the Company’s performance was strengthened by a countrywide uptick in tyre offtake. The Indian Government imposed an antidumping duty on Chinese tyres, which helped moderate imports and brightened prospects for domestic manufacturers. Besides, the country’s automobile sector (especially the commercial vehicles segment) reported an attractive recovery, which correspondingly strengthened tyre offtake. A number of states imposed stringent restrictions on the loads being hauled by commercial vehicles, causing fleet owners to acquire more trucks. This was one of the rare years when tyre demand remained consistently high throughout the year. The increased demand for tyres bolstered the offtake of bead wire, our principal product. Q: What is the agenda of Rajratan Global Wire during FY2018-19?